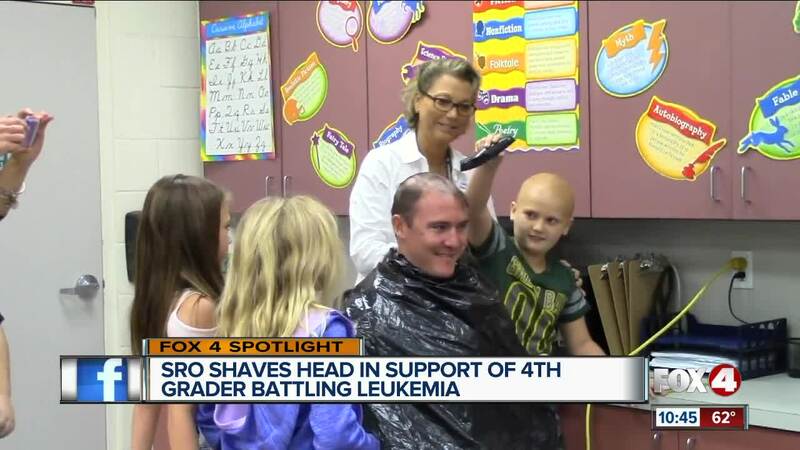 A student resource officer shaved his head to support a student at his school who has been fighting leukemia. CAPE CORAL, Fla. — A school resource officer looks a little different this week and it was all for one student at Skyline Elementary School in Cape Coral. Officer Andrew Miller shaved his head on Friday to show his support for a 4th grader who has been battling leukemia. Officer Miller said it was a quick and easy decision to cut his hair off, but it wasn’t painless. “Well at first it was pain because we had a bad razor. Then we had to go get another one,” said Officer Andrew Miller. He did all for a student named Amalia Mikulanec who he had only met once before. That was the first time he heard Amalia’s story. Her mom, Kari, would tell you her battle against Pre B-All Leukemia started many years ago when she was just 2-and-a-half-years-old. Amalia started a new treatment back in October and her first day back at school was Friday. Officer Miller decided then he wanted to give her a big welcome back. Officer Miller hopes his decision will raise awareness about Amalia’s condition. There is a GoFundMe page set up in her name. The Jim Cook Tournament and Banquet is also hosting an event for her on April 13th. It’s gestures like this from Officer Miller and the entire community that leave Amalia’s mom feeling so thankful. “The generosity and thought is beyond heartwarming…that someone would do something like that doesn’t even know us or her,” said Kari. The Mikulanec family also received an early Christmas present on Wednesday. Amalia’s latest treatment worked, and she is now in complete remission.